In China, John Leighton Stuart (1876-1962) is a controversial figure occupying an important position in the history of modern China and Sino-U.S. relations. As a scholar and educator, Stuart loved Chinese culture and contributed much to the development of Chinese education. While as a missionary, he was inherently prejudiced against Marxism. As the U.S. ambassador to China, Stuart executed U.S. government's policy, and was finally stereotyped as a symbol of "American imperialism". 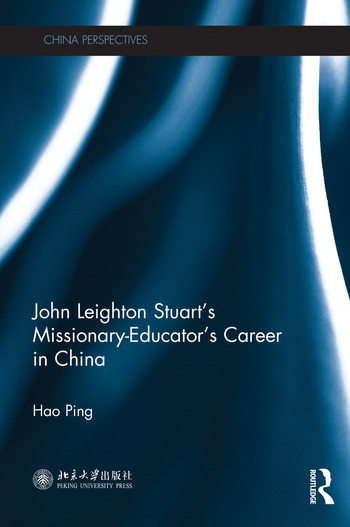 This book is a comprehensive and systematic study of Stuart's missionary-educator's career in China. It gives a detailed account of Stuart's missionary activities and contribution to the establishment and development of Yenching University as the founding president in China. Yenching, founded in 1919, left a significant and lasting legacy to Chinese education. It also contributed much to western studies on Asian culture with the Harvard-Yenching Institute established in 1928. By collecting substantial relevant materials both at home and abroad, both published and unpublished, this book reveals the multidimensional and complex features of Stuart, getting rid of the stereotype. Academic and general readers interested in Stuart, missionary education in modern China and modern Chinese history will be attracted by this book. Hao Ping earned his Master's degree in history from the University of Hawaii and Doctorate in International Relations from Peking University. His publications include Sun Yat-sen and America (2012), etc.